Zucchini and Lentil Tacos! A perfect vegan dinner. 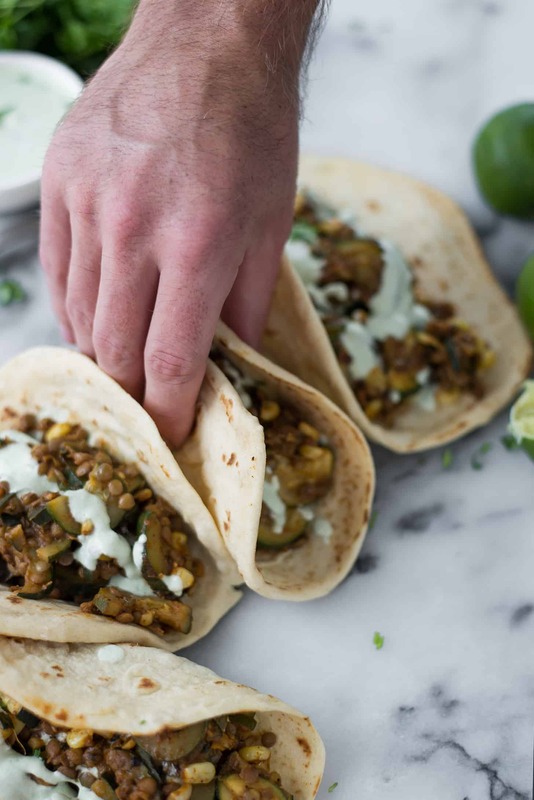 Spicy zucchini, corn and lentils with a creamy jalapeno-lime sauce. Zucchini + corn may be the most underrated flavor combo, ever. I find myself turning to it over and over again; no matter what the dish, it always seems to work. It’s also the perfect vegetable pairing in my house. Me, who loves zucchini and wants to put it in everything this time of year. My husband, who thinks zucchini is flavorless and boring but would eat corn every night for the rest of his life, no questions asked. Thankfully, we can both agree on tacos. 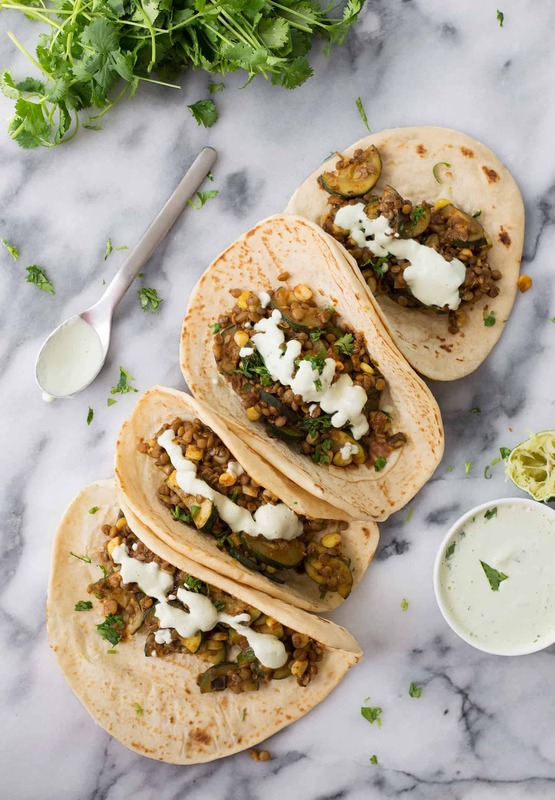 Charred, slightly smoky zucchini, corn and lentils tucked into warm tortillas and topped with a spicy jalapeño sauce. We spent Friday night on another marriage compromise, country music. Are you a fan? BL, midwesterner that he is, absolutely adores country music. I, on the other hand, just don’t get it. I’m trying to love tolerate it, but it’s looking to be an uphill battle. And that’s putting it kindly. So, when BL announced on Friday afternoon that he had grabbed us tickets to Luke Bryan’s concert, I was less than enthused. But, as I’m reminded constantly, sometimes you do the things you don’t want to do. So, I strapped on a smile and went. I know that BL doesn’t always love my crazy meals (or anything with curry powder), but he often eats them all the same. It’s just what you do. So, when I presented zucchini for the fourth time that week in these tacos, I knew his look. Thank goodness I added in corn and lentils, two of his favorites. If you’re looking for another easy weeknight meal to add to your repertoire, these tacos are it. I almost always have a thing of cooked lentils in my fridge, ready to throw into wraps, burritos, soups and more. I love lentils and think they are one of the more perfect foods: inexpensive, high in protein and fiber. What’s not to love? I encourage almost all of my clients to add more lentils to their diets, though I usually have to give ideas other than just soup. Yes, lentil soup is delicious (and I make a few really yummy versions of it), but there are so many other possibilities! Lentil patties, sloppy joe’s, salads, pie and coming this Friday- lentil burgers. My rule is this; if you can use ground beef, you can use lentils. Try it! Any recipe that typically would call for ground beef is the perfect place to throw in lentils. Even if you aren’t vegetarian, you can swap in half the meat and half the lentils. It’s an easy way to stretch a meal and increase fiber intake. Let’s quickly chat about the sauce. That sauce. That spicy, creamy jalapeño infused sauce. We all know that I’m just here for the sauce, willingly drowning most of my meals in a sauce of some kind. Sauces elevate basic meals and this one is no exception. 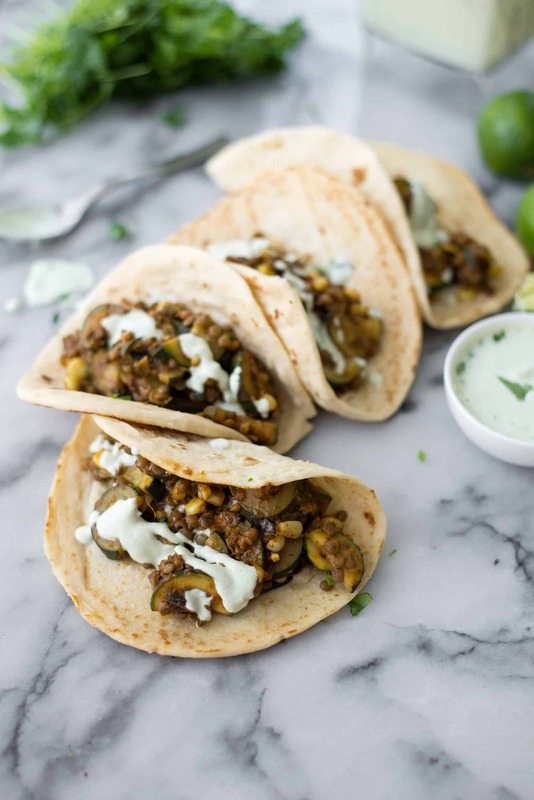 Cashews, jalapeño pepper and cucumber blend together to create a luxurious, dairy-free sauce that gives the perfect amount of heat to these spicy tacos. Try any extra sauce on potatoes, salads, nachos, or more tacos. 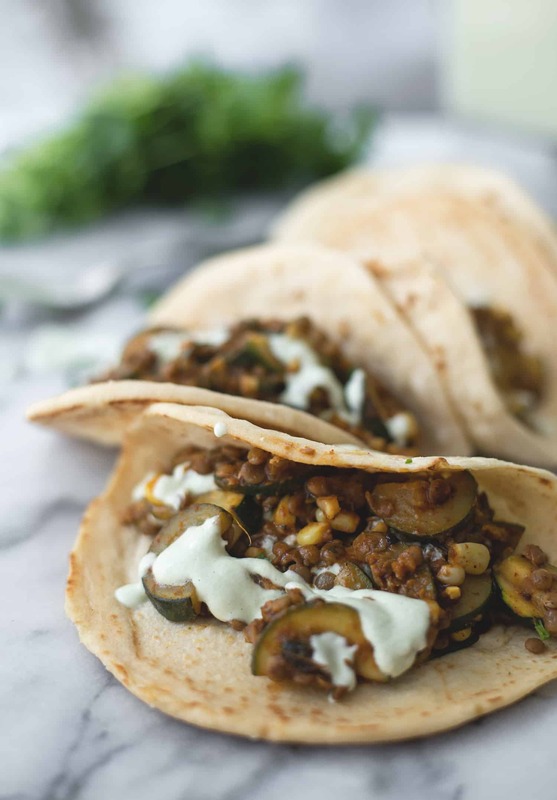 Zucchini and Lentil Tacos! A perfect vegan dinner. 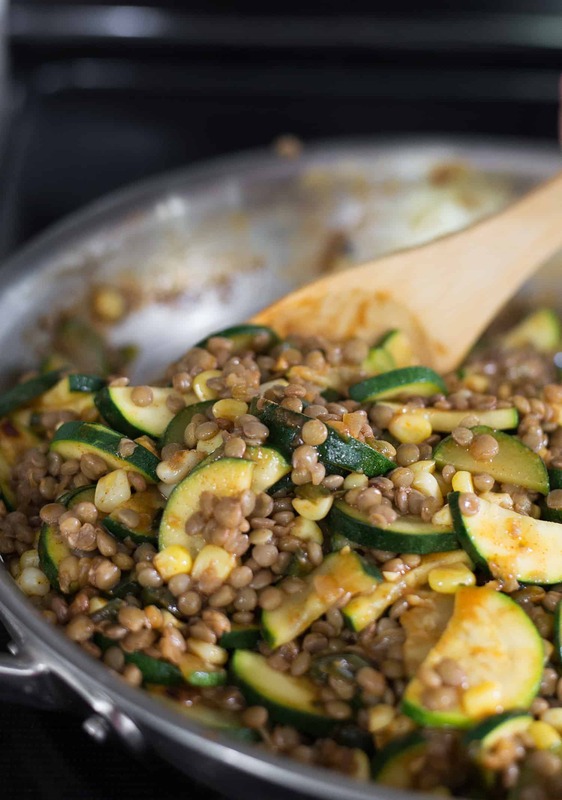 Spicy zucchini and corn, lentils with a creamy jalapeno lime sauce. Heat olive oil over medium heat in a large skillet. Add the onion and pepper and cook for 5 minutes, until onion is translucent. Add the zucchini and corn and cook until zucchini is tender, another 3-4 minutes. Add the lentils, taco seasoning and vegetable broth, stirring occasionally until thick and heated through. Season to taste with salt and pepper, as needed. While the lentils are cooking, make the sauce. 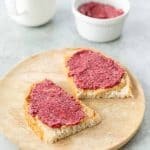 Place all ingredients in a high-powered blender or food processor and puree until creamy and smooth. Divide lentil mixture among tortillas and serve with lime sauce. I give this recipe 5 stars! 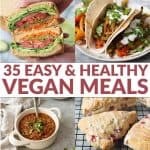 I have been vegan for awhile, whilr my husband is a work in progress, but even he loved these. The sauce really adds to the flavor. A great recipe. Thanks for sharing. Love hearing this! Thanks so much for the kind comment Janet. These tacos are soooooo good!!! I wish I would have doubled the recipe.